Lady Anne, Wido Arts, has brought together an experienced and amiable crew whose priority is your comfort and enjoyment. Indeed, it is greatly due to the warm and relaxed atmosphere on board that our passengers return year after year, even several times in the same year! 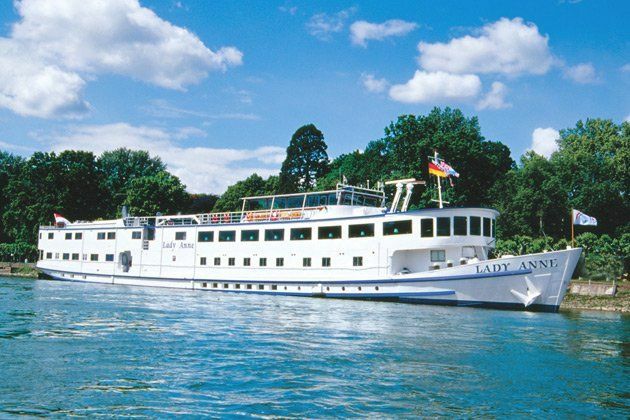 Wido Arts has been the owner as well as the captain of the mps Lady Anne for over 12 years. For him and his crew, their duties are so much more than a job – it’s their passion and together they go out of their way to make you feel at home from the moment you step aboard. That’s why repeat bookings are so high for this delightful little ship. With a maximum capacity of 100 passengers, it doesn’t take long for everyone to get to know each other on board the mps Lady Anne – and that includes Captain Wido and his crew! So much so that by the time you come to leave, you will no doubt be exchanging addresses and telephone numbers to keep in touch with newfound friends. All cabins, from single berths to triple berths, have outside views, heating, a safe and private facilities with washbasin, shower and toilet; two superior cabins on the Promenade Deck also offer a bath with shower attachment. Please note: the ordinary stairs are quite steep and those to the Passenger Deck are particularly steep, therefore the cabins on the Passenger Deck are not suitable for people with any sort of difficulties with stairs. Please also note that 3 berth cabins are 2 lower bunks and 1 upper bunk. Enjoy the passing scenery from this open area, where you can relax on garden-style seating and sun loungers whilst the ship's crew wait on you. There is also a small souvenir shop on the Main Deck which keeps you supplied with postcards, maps and a selection of souvenirs. Stair lifts lead from the Sun Deck to the Promenade Deck, Promenade Deck to the Main Deck and the Main Deck to the restaurant area of the Passenger Deck (the stair lift does not give access to the Passenger Deck cabins). Delicious meals are freshly prepared on board and served in the cosy restaurant. Breakfast is a hot and cold buffet, lunch is also a buffet and dinner is generally a set four course menu. Please note: vegetarian options and dietary requirements can be catered for on request. 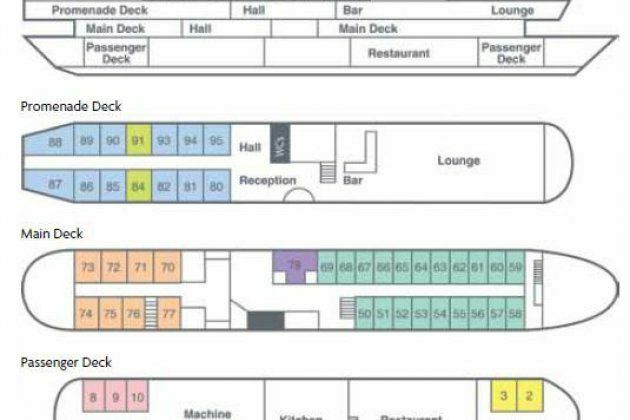 This is the social hub of the ship, with comfortable seating and panoramic windows to enjoy the views in the day and a dance floor and well stocked bar for the evening - the perfect ingredients for the Captains Party Night!